Montana Capitol. Jacob Baynham, Community News Service, UM School of Journalism. The 2013 Legislature garnered largely positive remarks from Democratic Gov. Steve Bullock and a host of criticisms from conservative Republican leadership after lawmakers concluded their business Wednesday. “The Democrats were able to work with commonsense Main Street Republicans, and we got a lot of great things accomplished,” Bullock said, citing the passage of state employee pay raises, a fix of indebted retirement systems and funding for major construction projects on college campuses. The governor did not see his entire legislative agenda passed, however. House Republicans halted legislation to use federal Medicaid expansion money to extend health insurance to tens of thousands of Montana’s poor. Bullock also lamented the failure of his plan for a $400 per homeowner tax rebate. This session saw an often-dramatic split between GOP leadership and a group of moderates who label themselves “Responsible Republicans,” as Jackie Yamanaka of Yellowstone Public Radio reports. The conservative leadership team of Senate President Jeff Essmann, R-Billings, and Majority Leader Art Wittich, R-Bozeman, say few, if any, of their priorities made it through the process. Wittich believes at least a quarter of the state’s record-setting $500 million dollar surplus should have been given back as tax relief. He sponsored a tax rebate bill which passed the legislature and is on the way to the governor’s desk, yet Bullock has been critical of the proposal as providing too much relief for corporations and the wealthy when compared with his failed $400 rebate plan. Wittich also calls the pension fixed passed by the legislature a “bail-out” of a failed system, and believes the pay plan spends too much. But Wittich says conservative Republicans still accomplished more this session than in 2011. Legislative Services reports that 1201 bills were introduced in total during the 2013 Session. The Governor has signed 268 as of Thursday afternoon. At least another 200 bills passed by the legislature wait for his decision. Decorum in The Montana State Senate dissolved into an uproar Friday over a missing Democratic Senator. Republicans saw the absence of Sen. Shannon Augare as the use of an obscure parliamentary procedure by the Democrats to stall floor action and kill some GOP-backed bills. The decision of Republican leadership to take votes on the bills anyway resulted in the Democratic minority leaping to their feet, shouting loud objections and pounding on their desks with anything from glass mugs to copies of the Montana Constitution. “I don’t want to characterize what they did as a Hail Mary or failed, but we did what we had to do and it’s done,” said Senate Majority Leader Art Wittich about passing the bills which, if also passed by the House, will put measures on the 2014 ballot asking to remove the state’s same-day voter registration practice and put in place a new primary election system that only allows the two political parties receiving the most votes move forward to the general election. Any ballot-measure bills which pass the Montana Legislature with a simple majority of both chambers move right to a public vote—bypassing the governor’s office. Historically, this was rarely utilized, but that’s changed the last couple years. The majority Republicans in both chambers have been using the tactic more often as a way to get certain measures past the veto of the state’s Democratic Governor. Friday was the deadline for referendum bills to transfer over to the opposite chamber from where they started. In a caucus meeting, Democrats discussed using a seldom-employed procedure known as a ‘call of the Senate’ to find Senator Augare, who had gone missing. Using that procedure would halt action on any bills until Augare was found. If the floor was halted for the remainder of the day, the bills objected to by the Democrats would not make the deadline and die for this year’s legislative session. Democrats say the votes taken on the referendum bills should not count because the party’s objection to the votes and their motion to call the Senate were not recognized by Republican Senate President Jeff Essmann. The story in the Senate so far this session has been over a split in the body’s GOP caucus between conservatives and more moderate Republicans who have been siding with Democrats on some key issues including education funding and Medicaid Expansion. Now, some Republicans are saying the actions of Democrats have re-unified the party. No opponents lined up to testify against a bill requiring schools remove students from participating in athletics if they show signs of a concussion. A long line of supporters spoke for well over an hour during a Friday hearing before the Senate Judiciary Committee. 22 year-old Dylan Steigers was an Easter Oregon University football player who died from a concussion in 2010. Steigers was from Missoula. The Helena Independent Record reports he had received multiple concussions before the one which ultimately took his life. “We have before us an opportunity to prevent injuries we know are going to occur, to reduce the risks,” Blewett said. The bill requires each Montana school district adopt a policy regarding the dangers of concussions. Coaches would be provided with information on how to recognize concussions. “It does take appropriate training to deal with this injury,” said Billings sports medicine physician Benjamin Phipps. He says those with a concussion may show symptoms that require management years after the injury. Concussion survivor Julia Hammond says she suffered a severe brain injury at 15 years-old when she was snowboarding with friends in 1999, “and my parents basically had a kindergartner on their hands,” she said about her mental state following the accident. She said recovery was a long and painful ordeal. Senator Art Wittich (R-Bozeman) worries this could create new types of litigation or charges of negligence against schools. The Senate Judiciary committee did not take action on the bill Friday. The lawmakers are back in town. Members of the 2013 Legislature arrived in the capitol this week. Capitol Reporter Dan Boyce tells us the parties have chosen their leadership in the Senate and House of Representatives. HELENA, Mont. 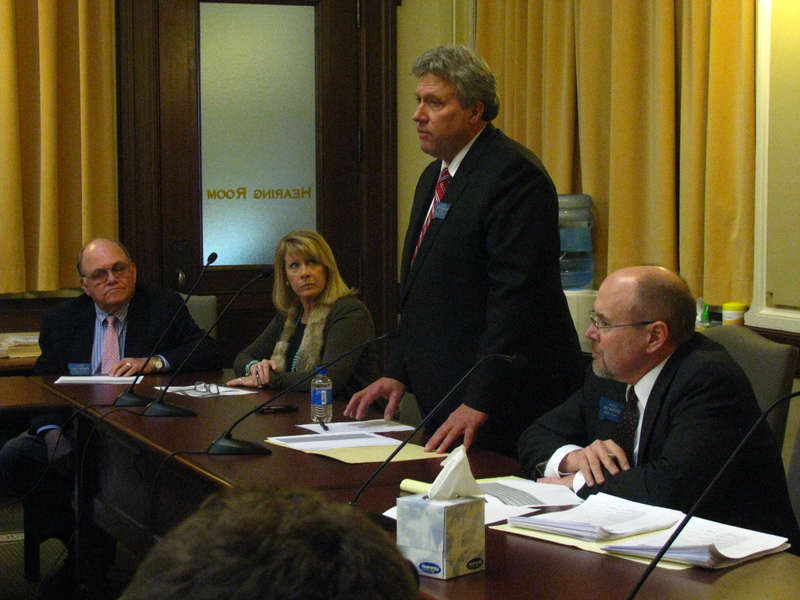 (AP) — Montana legislators are picking new leaders in advance of the 2013 Legislature. Republicans still control both chambers following last week’s elections. In the Senate, Republicans ousted Senate President Jim Peterson of Buffalo and rejected current Speaker Pro Tempore Bruce Tutvedt’s bid for majority leader. The GOP instead chose Sen. Jeff Essmann of Billings as their nominee for Senate president, Art Wittich of Bozeman as majority leader and Debbie Barrett of Dillon as speaker pro tempore. Senate Democrats picked Jon Sesso as their new minority leader. Republicans chose Mark Blasdel of Somers to fill a vacant House speaker’s post. Gordon Vance of Billings will be the new majority leader and Austin Knudsen of Culbertson was picked as speaker pro tempore. House Democrats elected Chuck Hunter of Helena minority leader.